Following the tragic, sudden death of her parents, Kate Spencer broke off her engagement from high school sweetheart Logan Daniels, just weeks before their wedding. She chose, instead, to remain in Mount Ridge, Tennessee to raise her younger sisters and help keep the family together. Now, with her sisters grown, she spends her days at family-owned Sweet Treats Bakery, hiding a wounded heart in the sweet confections she creates. Logan Daniels left town when Kate broke his heart, but now he's come home to claim what he lost four years ago, and he won't stop until he gets what he came for...Kate's kisses. A happy heart makes the face cheerful. Kate glanced at the clock on the wall over the pastry case and frowned. Her older sister, Mattie was nearly a half hour late…and she was never late. Sweet Treats bakery was her life…and passion. Something was wrong, and the idea caused a platoon of chills to march up Kate’s spine. She dipped the last ruby-red cherry into dark chocolate fondue, stepped back to survey her handiwork, and then took a precious moment to sigh with satisfaction. This was the best batch of delectable confections she’d ever prepared, by far. She had finally gotten the hang of the delicate process of combining ripe cherries, rich sweet cream, and chocolate, and the result was worth the effort. The new recipe would work nicely into the growing line of sweet-shop selections. 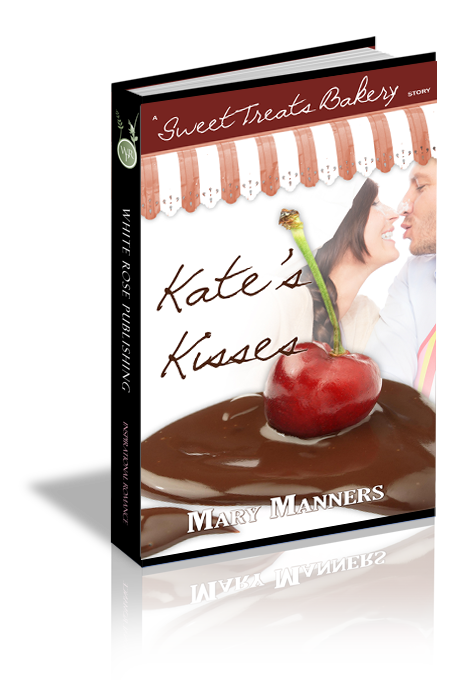 Kate reached for a towel and wiped beads of chocolate from her hands, then delved into the pocket of her apron for her cell phone. She’d give Mattie a quick call and see what was causing the hold-up. As Kate speed-dialed, the bell on the bakery’s door jangled. A cool breeze filled the room as the door swooshed open, and she glanced up to see Mattie rush in. She wasn’t wearing a jacket to ward off the early-spring chill, and her white cotton blouse was rumpled and untucked from the waistband of navy slacks—highly unusual. Though often casual, Mattie’s appearance was unfailingly neat. Kate frowned. One of the shoelaces on her sensible tennis shoes had come untied, and it flopped with each step. Breathless, Mattie shook her head. Her eyes were huge, onyx-black saucers. Kate couldn’t imagine what had her so rattled. Mattie was the most unflappable of the four sisters. She had to be—she was the oldest. “L-Logan?” Kate followed Mattie’s gaze and her heart caught at the sight of him striding across the two-lane street, his long legs eating up the ground between them. His dark hair curled in waves around the collar of his navy polo shirt and smoke-gray eyes seemed to be searching for something through the storefront glass. Could it be…her? “Oh, Mattie, you can’t let him in. I don’t want to see him again—ever. Not after…” The room suddenly began to darken and whirl, and Kate grabbed the counter. The bell over the shop door jangled as Logan stepped inside. His gaze found Kate, and when he smiled, heat flared in her belly. To her utter dismay, her insides melted into a puddle of hot paraffin. She felt paralyzed as his gaze wavered between her and Mattie. “Hello, Mattie.” His deep voice was as smooth as warm caramel. Kate's Kisses is based on Proverbs 15:13, 'A happy face makes the heart cheerful.' Which do you think comes first--a happy face or a happy heart? Why? Q2. Why do you think Mattie left Grace and Logan alone when they were first reunited? Do you think she was right to do this? Why or why not? Q3. What is the significance of Logan starting a tab at Sweet Treats? How do you think Kate felt when he asked her to do this? Q4. Grace refuses to leave the bakery to rest, though nightmares leave her tired and shaken. She asserts, "I need to keep busy." Do you think keeping busy helps heal a wounded heart? Q5. How does Tessa's conversation with Logan demonstrate the strong bond shared by the Spencer sisters? Q6. What do you think of Kate's reaction when Logan admits he still loves her? How do you think you would have reacted in this situation? Q7. What do you think of Mattie's statement, "I'm nearly thirty. It's almost too late for me," when Kate asks about her desire to find a husband and have children of her own? Q8. How does the completion of the library also signify a change in Logan and Kate's relationship? Q9. What is the significance of Logan calling Kate 'Katie'? Why do you think he's the only person who does this? Q10. When Logan asks Kate, "What would be a happy ending for you, Katie?" and she responds, "I don't know," what do you think she really means?